YFGW410 Field Wireless Management Station is based on wireless communications standard ISA100.11a for industrial automation of International Society of Automation (ISA). This product has system manager/security manager/gateway function based on ISA100.11a, and combining this with Field Wireless Access Point (YFGW510) and/or Field Wireless Media Converter (YFGW610) composes the field wireless system. Adoption of discrete-type architecture enables a redundancy configuration by connecting two products. A highly flexible operation is also possible where the field wireless system under operation does not have to be stopped and maintenance can be performed on line. This product supports the access control list (IP filter and port filter), preventing unauthorized access, and role-based password-protected secure user interface. End-to-end communication of ISA100.11a is encrypted with AES 128bit. Robustness of the communication and security is validated as it achieves Achilles Level 1 Certification. This product can encapsulate foreign protocols such as HART and Modbus and transfer them between devices and host systems. By transferring safety communication protocol such as PROFIsafe between a Safety Instrumented System (SIS) and wireless safety devices and thus contributes to achieving required Safety Integrity Level (SIL) for the entire safety system. This product can utilize the bandwidth of the field wireless network flexibly for achieving reliable and efficient wireless communication. 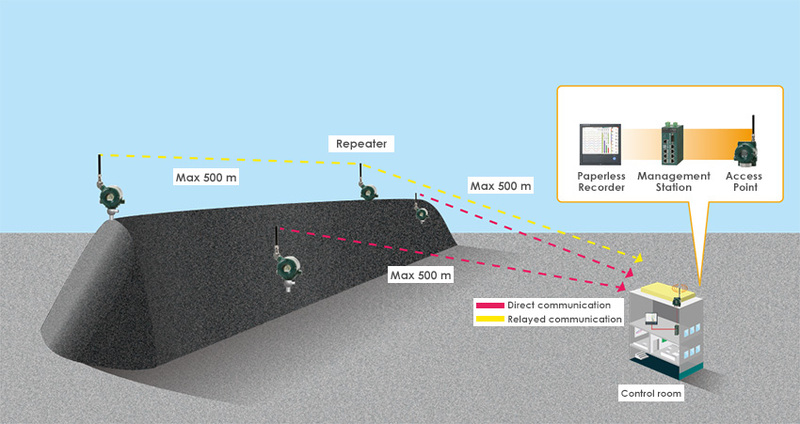 Duocast function enables receiving data simultaneously with two backbone routers (BBR) connected to this product. The built-in data cache function saves bandwidth of the field wireless network and energy consumption of the field wireless devices. 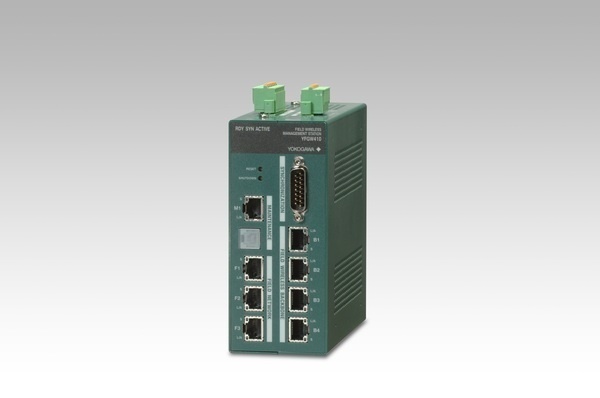 OPC interface connection is available by Field Wireless Device OPC Server (SSS7100). For details of this product, see related products General Specifications. In outdoor wiring to Field Network or 100BASE-TX of Field Wireless Backbone, use optical fiber cables with a nonmetallict ension member, combining with YFGW610. TCP based custom protocol used for communication between this product, "Field Wireless OPC Server", "FieldMate Versatile Device Management Wizard", "Plant Resource Manager (PRM)", and YFGW510. For details of each product, see related products General Specifications. Maintenance/Diagnostic Network (100BASE-TX, RS-232C) are not available for outdoor wiring. These are the serial ports for a maintenance which only our company use. In outdoor wiring of Field Network or Field Wireless Backbone, it is recommended to use optical fiber cables with a nonmetallic tension member, combining with YFGW610. TCP based custom protocol used for communication between this product, “Field Wireless OPC Server”, “FieldMate Versatile Device Management Wizard”, “Plant Resource Manager (PRM)”, and YFGW510. For details of each product, see related products General Specifications.